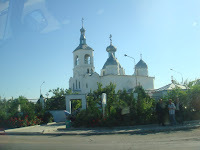 Last Sunday we all stopped at the only church in Aktau. Ever other religious building in town is a Muslim Mosk. They said it was a Russian Orthodox Church but that they don't hold services. It's just a place to pray. As you can see from the pictures it's very different from our churches but very beautiful. Inside it's much smaller than it looks from outside with just one room with an alter and floor to ceiling paintings of "saints" we think. There was only one crucifix off to the side and not many crosses, no pews but a couple of benches to sit on and no priest around. Just an older couple who were clearly the caretakers. It was amazingly peaceful. Enjoy the pictures. Today is Sunday June 17th and tomorrow we go to court. Weather we actually get to see the judge is anyones guess. I hope that by this time tomorrow we are done with the whole court thing and just have to get through our 15 day waiting period. We have been practicing our speeches and I think we're ready to go. I can hardly wait to wear a black suit with heels and hose tomorrow since it's going to be around 96 degrees. What I'll do for Lexie!! 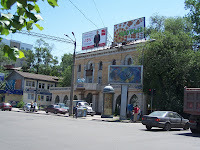 Since we are at the internet cafe and I've got my flash drive with the journal and pictures from our walk around Almaty and flying to Aktau I'm going to go ahead and post it. It's long of course but check out the pictures and wait for tomorrows posting when I hope to be telling you we had a "positive decision" as they say around here. Wish me luck tomorrow at court!!!! Sorry about the mix ups on the dates. Between jet lag and time changes I’ve been a little off. I am pretty sure today is Thursday May 24th and we’ll be flying out this evening to Aktau. It’s a 3 hour flight and they say the air planes are modern. We’ll see soon enough. Today we got up and repacked everything before heading out for a little local site seeing and shopping. I took my camera so I hope to add some pictures to this posting. We ended up going one block too far so we saw some more “residential” streets. All the buildings are apartments and usually there are stores on the first floor of these apartment buildings. Last night Flora told us that in 1990 through 1992 when they declared their independence from Russia that the Russian government just gave apartments away. I guess they had owned all these buildings so rather than give them to the new government they wanted to look generous so they literally gave them to anyone willing to wait in the lines to get them. I didn’t get all the details but it sounds like some people waited for months to get their own apartments. I’ll have to find out more but how amazing is that. So most of the population lives in these apartments. That’s why they said the outside of the buildings look so bad but most of the insides of these places are well kept. No one wants to pay of the upkeep of the exterior of these buildings. We aren’t that extreme but we’ve certainly seen Home Owners Associations fight over what is necessary for up keep and what isn’t. So anyway that’s why this lady had the apartment we are staying in here in Almaty and the same is true for the apartment in Aktau. The couple that owns the apt in Aktau has a better apartment now but still rent that one out. I hope it’s cleaner and in better shape than this one. 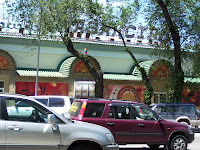 We also saw a movie theater right next to a casino as we walked along this residential street. And no, Mom & I did not go in to play a couple of hands of blackjack – but we were tempted. 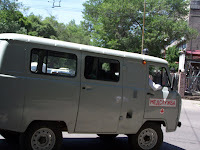 Then this ambulance drove passed us on the corner and we both said a little prayer that we don’t need their services. It looked like it was made during WWII. I don’t even want to think about getting seriously ill while we are here. No thank you! Then we turned another corner and found the mall. 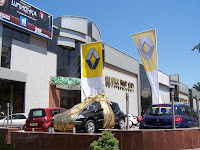 It looks like they are giving a car away today so maybe it will be our lucky day. 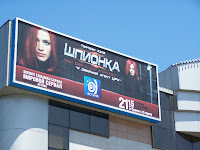 Note the billboard for Alias. I’ll have to find out if it’s a NEW series on TV here. 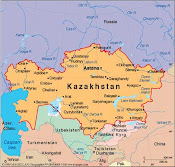 Most of what I’ve read about Kazakhstan was how formally they dressed and that they would be offended if we visited the baby house in jeans and a t-shirt. Well I’m not sure where all these formally dressed people are but they weren’t in Almaty. Most of what we saw was very scantily dressed women and men sitting around smoking in jeans and a t-shirt. There were some nicely dressed men in suits but it was clearly for work. It’s the women I can’t get over. Very tight paints, short skirt, tight shirts or see through shirts with plunging necklines and of course very high spiked heels. In the US they would be considered slutty. Let’s put it this way, Dolly Pardon would blend right in. 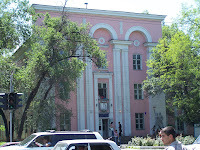 Now this is their capital – actually there old capital but most of there government work still happens here - so these folks are the more sophisticated Kazakhs. I’m curious to see what their country brethren dress like. One more thing that we notice while walking around, which I remember from the Philippines but never hoped to see again, where snot rockets. For those of you that don’t know what a snot rocket is place your right index finger to your right nostril and press. Then blow really hard out of your left nostril. CAUTION only do this out side and don’t blow too close to your shoes. Now you get the picture. I know the toilet paper around here is rough but there has to be a better way to blow your nose. That is one of the foulest habits I’ve even seen. I can say with certainty that I will not be walking around barefooted like I would at home. Back to shopping. We picked up a couple of things from the grocery store for the morning since Zina told us that we would be getting in so late to Aktau and they didn’t really have breakfast places to eat so we should bring something with us. Now don’t forget that we packed 180 packs of brown sugar oatmeal for Mom so I figured we would not starve in the morning but what the heck. So we bought a couple of baked goods that we had no idea what was in them but looked good and off we went to see what else was in the mall. Now this mall is 3 stories high but much smaller than a free standing Sears would be. The shops are each about 500 sq ft and mainly have clothes but they also had a sheet and towel shop (don’t forget our lovely pair of towels at the apartment so towels are clearly a luxury item here) and some jewelry stores. On the third floor was the crown jewel. A Cineplex that had I believe 2 movie theaters one playing Spiderman 3 and the other Shrek 3. 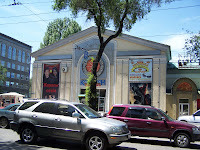 Right in front of it was the internet café that Mom found and I sent our first blog posting from here in KZ. After that we went over to the food court and what do we find but a “KING BURGER” complete with the whopper!! I hope the pictures get attached so you can see why even though it was a Burger King we had to eat there. What I didn’t get to take a picture of was this salad bar full of totally unrecognizable vegetables and rice dishes and who knows what else. Oh yeah and pizza but not exactly like we would make it. I almost got the pizza but I just couldn’t bring myself to try it. So we went with what I thought was the whopper meal and a club sandwich. Now here a club has hard boiled eggs, a think slice of ham or some kind of meat (I really hope it wasn’t horse) and cucumber slices. The whopper was on 3 very thick slices of bread but otherwise looked the same. They clearly use a different kind of oil and quality of meat so it tasted different but not bad. There where a lot of teenagers hanging around talking on their cell phones and to their friends so it was really pretty much like home in that regard. Mom got to have her first public bathroom experience in the mall. First there is an attendant that sits outside of the entry at a little table that has sheets of toilet paper (yes their rough kind) and a sign with 20 tenge on it. So Mom comes back for some change to pay for it and her purse with Kleenex and off she goes. Overall they were fairly clean but the amount of toilet paper that you get for 20 tenge (about 16 cents) was maybe 3 sheets of our toilet paper but extremely rough and not very absorbent. It really makes you re-think the whole hand shaking custom we have. Anyway, we headed back to the apartment and waited for the driver to pick us up. They were early so we’re glad we headed back when we did. He took our bags downstairs where Flora was waiting but no Zina so we all just hugged, smiled, then got in the car. We went through some pretty sad parts of town to get to the airport. One area was just rows of small stucco houses with rusted metal roofs packed tightly together. But don’t worry - about every 10 houses or so I’d see a satellite dish on top of the tin roof. I’m sure they had a 52 inch plasma TV as well. When we got to the airport we meet up with Zina. She and I had to run down the stairs to get my lost bag & stroller. They make us go into the area where they load the baggage (visualize Toy Story 2 the airport scene when they lost Woody and have to rescue him from the luggage on the conveyor belts – only there are just two belts) and drag my luggage out by ourselves (the agent had really high spiked heels and a cute uniform on so clearly she wasn’t going to help.) Then we go back upstairs where Flora then pushes herself to the front of the line to have our tickets stamped - no security of any kind except to check our passports with the names on our tickets. They couldn’t have check too close since the name on my ticket was Lowanne Qwast but they still let me through. Then on to check our luggage. They have been teasing us about how much we have since there are 4 large bags (3 weigh 50 lbs & one 70 lbs), the stroller, 2 pull along carry on bags, my computer case, the diaper bag that I’ve been using as a purse and mom has a large canvas bag that she’s using as a purse. So yes, we have a few things with us. When we get to the counter they talked a long time and then I put the bags up one at a time but the baggage agent leaves Zina’s bag half on with mine. I asked her why and she said they will count some of the weight in my bag for Zina’s bag. Okay?! So we only had to pay 750 tenge which is right around $60, which was about what I expected. Now you have to go back through the ticket check in line to pay for this overage. So we pushed our way back through the lines and when we got to the pay counter they said I had to pay 880 tenge instead. I still don’t know why but I just paid it. So we go back in (without our tickets I might add) and they gave us a tag for each of our carry on and then we waited. We sat away from the gate entry which I found interesting since Flora seems to like to be first in everything. Well soon I found out her plan. When they announced our plane she jumps up and runs over and cuts to the front of the line while she is waving us to follow her. Zina said hurry, hurry Flora wants to get on first so we have room to store all our carry on (which I guess makes this our fault.) So we just push our way to the front of the line and everyone just let us. Of course it would have started a riot at home but better to offend these strangers than the woman who should shortly be introducing me to my daughter. We had to put our bags on the conveyor belts and they x-rayed them but we didn’t have to take anything out including liquids or our computers or cameras. On we go to the plane. It is a 737, so there are 3 seats on each side of the aisle. Our tickets had Mom sitting alone across the aisle from Flora me in the middle seat and Zina at the window. I asked Zina if we could switch so I could look out the window at the city as we left. She said no problem but Flora had other ideas. She had Mom sit in the middle, me at the window and Zina across the aisle by herself. Don’t forget that the only way we can talk to Flora is through Zina who is now the furthest away. Our Flora definitely likes to control things. One mystery meat meal later we landed in the dark so I really couldn’t see anything of the city. We get off the plane to ride a bus over to the terminal and by the time we got in line the first bus was full. Of course Flora didn’t see it that way so she just pushes her way on and then waved good-bye to us. What a character. So we get to the terminal and ReNot (that’s how it’s pronounced but I have no idea how it’s actually spelled) our driver is waiting for us. We wait a while for the luggage but it finally comes and we drag our butts and all our luggage to this “lemo” - it says so right on the side of what we would call a mini-van – and load it up. There is a red cylinder tank in the back of the van that we load the luggage onto so I asked what it is. Come to find out this car not only has the wheel on the right side of the car but it runs on either “petrol” liquid gas or “gas” meaning natural gas – propane, I think. She said “gas” is much cheaper than “petrol” so people will wait in line as long as 24 hours to fill their “gas” tank with propane. Sure enough we drive by a “gas” station with a line of about 40 vehicles. She said they will wait until morning with the hope that there will be a delivery of more “gas” in the night so they can fill up. Wow, at least we don’t have to wait to pay our $3.50 + per gallon for “petrol”. The airport is about a 25 minute drive from town and all we see in the dark is desert on our way in. When we get there it’s still very barren looking with five and six story concrete apartment buildings everywhere. Zina said something to Flora who didn’t sound happy but we pulled over at a little store and Zina said she was going to run in to get water since we can’t drink the water in this town. I of course said I’d like some too so we jump out with her. Zina was clearly ticked so I asked what was up and she said Flora had said that she should be more prepared and brought her own water as Flora had done. She is clearly still making Zina suffer for taking us around town yesterday. I would think that we should have made the stop regardless since we needed water to brush our teeth and drink in the morning. Oh yes, speaking of water, Zina let us know that there is no hot water at the apartment. What?! I had heard from other families that had adopted from KZ at sometimes you don’t have hot water from time to time here but our first day? Zina explained that the whole town did not have hot water. What? How does that work? Do they have one giant boiler for the whole town? I just don’t get it. Zina didn’t know how it worked either only that we would not have hot water for a few days maybe a week or more. This baby had better be pretty darn cute! 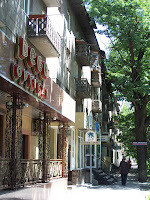 As you can see from the pictures it is much nicer then our apartment in Almaty and so we pull out what we need for the morning and try to get some sleep. Between the heat and the noise from the open windows I didn’t think I’d sleep much but we both sleep hard for about 7 hours.